Rumor has it the next-generation Chevrolet Corvette prototypes run mostly at night. But someone decided to hit the test track in broad daylight, and one of our spy photographers was on hand with their extra-long lenses to take advantage of that error. 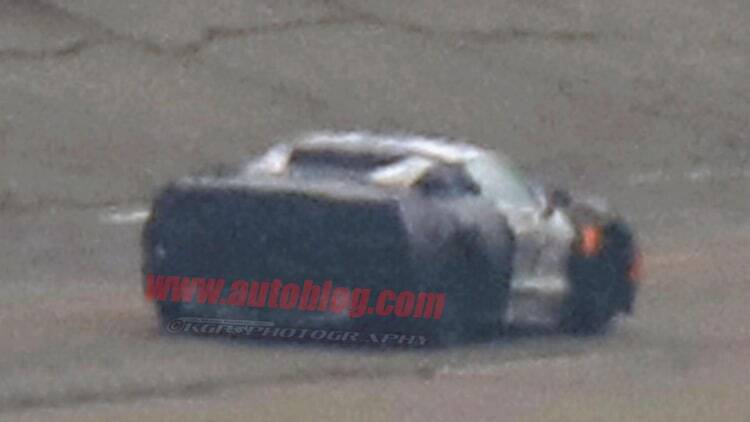 These photos show what appears to be a mid-engine Corvette test mule. Car and Driver claims that the Chevy's iconic sports car will switch to the new layout for the whole lineup, not just for a supercar halo model. Admittedly, the images are extremely grainy – these shots were taken from around a mile away according to our spies. But thanks to a C7 running alongside this prototype we can see the new Vette looks a little wider than. There also seems to be body material where the rear window would be – most likely flying buttresses – but it's difficult to tell at this range. Beyond this analysis, we can't accurately comment on the C8's design because, well, the car in photo probably doesn't have production bodywork. This leak also shows that Chevy has advanced so far beyond the mule stage. The next Corvette has moved from its Holden Ute-based mules to a very early pre-production spec. That development also comes with a severe increase in security at General Motors Warren Technical Center. Only high-level designers and execs have been allowed to float around the company's mid-engine design studio. We're still looking for the 2019 Corvette to debut at the 2018 Detroit Auto Show. The current C7 debuted at the2013 Detroit Auto Show. If our spies are correct, that means Chevy will replace the C7 after just five years. Only the second-generation model spent less time on sale. That thing looks big to me, like GTR-ish. Interested to see what happens. It's hard for me to imagine a rear engined corvette. I was the biggest skeptic ever when we first started hearing things but it definitely looks like they're headed that direction. Oh man, oh man, oh man! !